Rick McWane knew the importance of new concussion rules for Major League Baseball. The longtime trainer for the Twins served as a committee member revamping the rules for 2011, with an eye toward protecting players from the long-term impacts of the injury, The Associated Press wrote. "You try to take as much off the player as possible, to try to be a hero, to try to shake it off," McWane told The AP that March. "That's just not acceptable." McWane spoke with the experience that nearly a quarter century as a trainer provided. He's since moved on to continue in sports medicine and concussion programs at an orthopedic center in Minnesota. McWane started as a trainer in professional baseball out of Liberty University in 1987 and climbed all the way up to the majors to become head trainer of the Minnesota Twins. 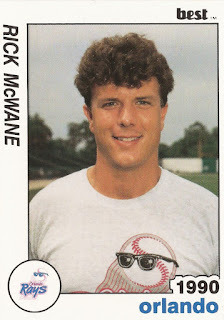 McWane's first job came with the Little Falls Mets in 1987. He stayed there two seasons before joining the Twins system in 1989 with Visalia, according to his Best card. He made AA Orlando for 1990, staying there for 1992. He stayed in the minors through 2001, including serving as a trainer for the 1996 AAA All-Star game, according to Bullpen. He made Minnesota for 2002 as assistant trainer. In 2005, he became the club's head trainer, a role he continued in through 2012. In April 2011, McWane watched over the return of Joe Mauer from leg weakness. "He didn't have any issues with his knee at the end of spring training, and still, his knee feels good," McWane told Bollinger Beat on MLBlogs.com late that month. "It wasn't a matter of his knee not being ready, he just I don't think had the repetitions catching or anything else. Once the season started, he started to wear down." McWane has since taken a job as sport concussion program coordinator with Tria Orthopedic Center i in Bloomington, Minn., a job he continues in 2016.